And we're in the final third of Jane-Emily! Oh dear. So Adam is going away for a week's course in surgery, and it's all and good for him, but here's the thing. He's also all "and I leave tomorrow." And I'm really, you had no notice of this? You had to wait this long to tell Louisa? And there's a hint of a proposal to come. Martin who, right! And Louisa is doing some nervous cleaning and long story short, finds something hidden in Jane's mattress, which used to be Emily's, and it's a child's blood oath of marriage between Adam and Emily. And of course Louisa totally loses it because what 18 year old wouldn't be jealous of and threatened by a dead 12 year old everyone describes as evil and bratty? And Jane is also losing it, saying Emily "wanted me to do things" and I'm all WHAT THINGS JANE WHAT THINGS. And I like that there is a hint here that there isn't a Ghost Emily but instead some lonely, damaged, insecure women who are obsessed with a dead child, because that child has more personality than any of them. And Jane did those things on her own and blamed Emily. Oh! The dress, the favorite dress, has been ruined. And based on the timeline, Jane wasn't around, so we can't blame her. Louisa clearly blames Emily. Now Louisa is wondering about Jane being the catalyst for what is going on. 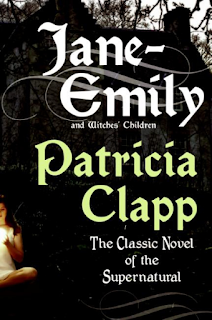 And I do wonder how much of Emily's haunting are things Jane has done -- but even that works for haunting, because it's what Emily has made her do. But, but, but, Jane wasn't around for the dress bit! Plus, you can't blame the wind because there was no wind. Adam proposes! And how funny is it that this book is built around a courtship and proposal? And Louisa's first reaction is to say I don't know and cry. So Adam goes all he-man and hustles her away and then turns her "roughly" and leads her "forcibly." But why wouldn't Louisa want this in a husband? It is 1912. We haven't seen her father, but everyone around her seems to see her just as wife material. Plus it is a light romance, fairly non threatening. And Louisa keeps crying and says it's because Emily will hurt Jane and so Louisa shouldn't marry Adam to protect Jane and maybe it's because Louisa realizes that Doctor Pipe isn't that great but she cannot identify why and wow am I over-reading into this. And the pipe comes out. NO THAT'S NOT WHAT I MEANT. Oh and here's something else to ponder about how forceful and in charge Adam is; this is the same person who let/liked Emily bossing him around as a child. So Jane got herself locked out of the house in the rain, and even thought it's August, it's cold, and long story short, most of our main players are convinced Emily did it to kill Jane and yes, Jane is getting might sick. So Jane is getting sick and Louisa goes to call Adam but she doesn't have his number because she never telephoned him. What? I guess this is 1912 etiquette for engaged/courting couples? And then -- and then -- we get this firm position: "Good is still stronger than evil," and "I have no fear of the likes of Emily." Does this mean that Katie doesn't think Emily has killed her brother and father and wants to kill Jane? Or that she thinks Emily is more a memory than a true ghost? I like how matter of fact Katie is, also reassuring to the reader. And it's all terrible and sad and scary and even the weather is getting into it and finally FINALLY Mrs. Canfield does what she never did before and says "no" to Emily: "I will not allow it." She will not allow Emily to take Jane? She will not allow Emily to haunt them all? She will not allow the past to control the present? Whatever, she finally, finally disciplines Emily. But the ball is glowing! So Mrs. Canfield goes out and knocks it over and Jane screams and all the scary nature stuff stops. And Adam is around for all of this but says very little. Is he thinking "goodness the hysterical ladies" or "huh, Emily is real"? In a way, the chapter after the last. Because Emily was vanquished by her mother. Is it the mother finally parenting Emily? Is it a guilty mother finally deciding to get on with her own life and not live in the past, be controlled by the past? Anyway it's all better and happy families! They're opening windows and letting in light and cleaning out the attic! And there's some pity for the child who "needed an authority and discipline she never got." Remember, kid readers: Mom and Dad yelling and taking away the WiFi code is because they love you and don't want you to become a terrible ghost. And then the final wonderful sentence: "None of it could have happened. And yet it did. Or did it?" And tomorrow, my final thoughts!